If all went according to plan, she should't have been there in the first place. 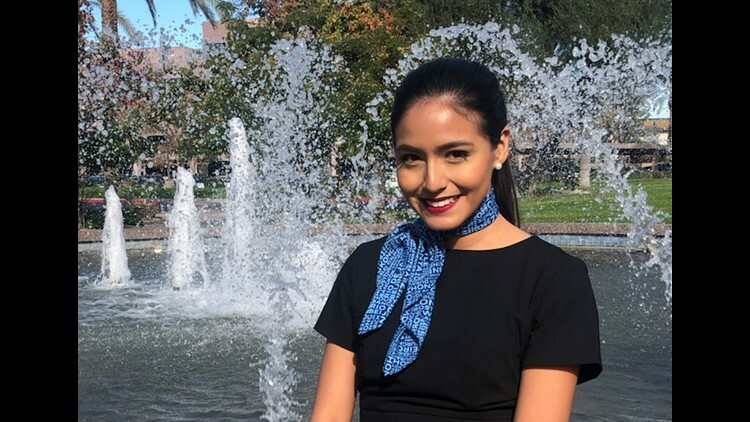 COLLEGE STATION, Texas — For the bulk of College Station flight attendant Selene Roman’s stay in a Conroe, Texas ICE detention facility, she was cut off from the trade group that represents her interests and would eventually help free her. It was not until the sixth week of Roman’s detention that the Association of Flight Attendants (AFA-CWA), the flight attendant’s union, heard of her plight. Soon after, they mobilized to get her out. Roman’s ordeal was first reported by the travel website thepointsguy.com. It told the story of her husband and lawyer’s attempts to get her out of ICE custody. Roman, a DACA recipient born in Peru, is not allowed to leave the country under Trump Administration policy. Her husband, David Watkins, was born in the US and is a College Station resident. That online story went viral on Thursday, March 21, and earned the attention of higher ups at the AFA-CWA. “Our relationships on the hill got her released,” said Sara Nelson, the president of the AFA-CWA in an interview with KAGS. The union said they presented lawmakers with a joint statement from their representatives and Mesa Airlines, Roman’s employer, in which the company said an administrative error caused her to be assigned an international flight. The company said Roman informed them of her DACA status during the hiring process. She added that the couple are working on earning Roman a permanent resident status and then subsequent citizenship. To become a citizen through marriage, Roman must first become a permanent resident. “The whole issue of status and your ability to fly between countries is an issue that the airline industry has to grapple with all the time,” Nelson said, adding that things like DACA restrictions and the Muslim travel ban have significantly impacted flight attendants, sometimes even mid travel. Nelson adds the stark change in immigration policy in the last two years has made airlines consistently reexamine regulation and make sure certain flight attendants are fit to fly abroad. “I think this is a failure on everyone’s part here, except for Selene’s,” Nelson said.